I have a shot of this on the Battlestar Galactica page, but I ran across an unopened one in excellent condition. I have always wanted Viper Launch Station, but they’re damn big. This one was also damn expensive. They wanted $200 for it. It is based on a plane launching toy and sends small vipers into the air via a rubber band powered launch pad. I have found the toy before, but the vipers are usually pretty “battle damaged” from a few too many flights. A very cool toy! I had this one as a kid. I remember it shot little foam starfigters. Man, roaming around this site is making feel guilty about all the money my Mom must have spent on me as a kid. This was a great toy, as were the similar aircraft carrier toys Mattel released in previous years. 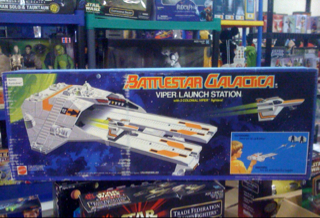 The Vipers flew well & far, the box art is great, & its a terrific display piece & playset for Galactica figures. Now, if I could replace the one that got chucked in the garbage. . . .